A few weeks back – we asked you if you would like to join us. 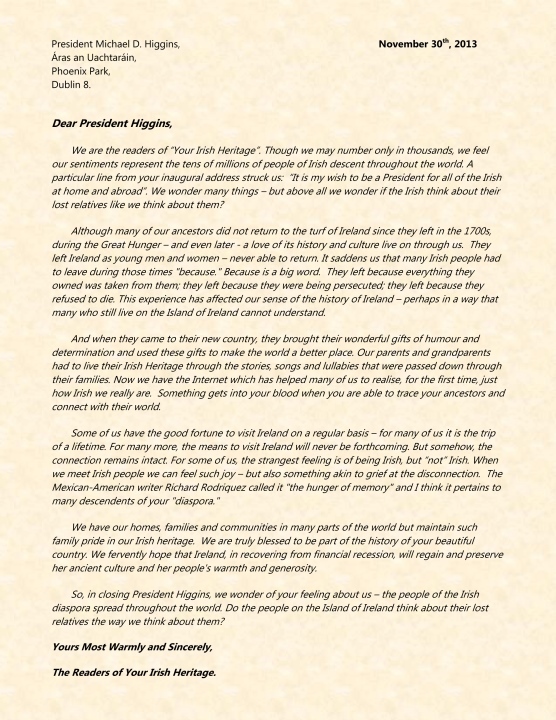 Join us in sending a letter to the People of Ireland – care of the President of Ireland – Michael D. Higgins. It would be a letter from the readers of Your Irish Heritage – the vast majority of who live outside the island of Ireland – a letter that tries to articulate just what it means to be of Irish descent. Just what it means to feel a strong connection of culture, value and heritage despite the distance of the miles and the years. On December 7th, I posted this letter shown (along with all the individual letters shown below) from the General Post Office in Dublin – scene of the 1916 Rising. So, please do feel free to read these wonderful words from so many of our readers – and we would love if you would add your own words and comments in the section at the end of the page. We are the readers of “Your Irish Heritage”. Though we may number only in thousands, we feel our sentiments represent the tens of millions of people of Irish descent throughout the world. A particular line from your inaugural address struck us: “It is my wish to be a President for all of the Irish at home and abroad”. We wonder many things – but above all we wonder if the Irish think about their lost relatives like we think about them? Although many of our ancestors did not return to the turf of Ireland since they left in the 1700s, during the Great Hunger – and even later – a love of its history and culture live on through us. They left Ireland as young men and women – never able to return. It saddens us that many Irish people had to leave during those times “because.” Because is a big word. They left because everything they owned was taken from them; they left because they were being persecuted; they left because they refused to die. This experience has affected our sense of the history of Ireland – perhaps in a way that many who still live on the Island of Ireland cannot understand. And when they came to their new country, they brought their wonderful gifts of humour and determination and used these gifts to make the world a better place. Our parents and grandparents had to live their Irish Heritage through the stories, songs and lullabies that were passed down through their families. Now we have the Internet which has helped many of us to realise, for the first time, just how Irish we really are. Something gets into your blood when you are able to trace your ancestors and connect with their world. We have our homes, families and communities in many parts of the world but maintain such family pride in our Irish heritage. We are truly blessed to be part of the history of your beautiful country. We fervently hope that Ireland, in recovering from financial recession, will regain and preserve her ancient culture and her people’s warmth and generosity. So, in closing President Higgins, we wonder of your feeling about us – the people of the Irish diaspora spread throughout the world. Do the people on the Island of Ireland think about their lost relatives the way we think about them? The Readers of Your Irish Heritage. Greetings to you! Even though I have not yet had the pleasure of visiting your fine country (and I definitely will do so one day), I Love Ireland! I love the people, the culture, the music, the history, the poets and writers who have come from Ireland. I am very proud that I can claim some Irish heritage. My great-grandmother, Bridget Mannix, came to America from Ireland during the Potato Famine, and settled in Providence, Rhode Island. I don’t know a lot about her and I’m still researching, but through help from Mike Collins and Your Irish Heritage, I’ve learned that my Mannix likely came from County Cork. When I visit Ireland, County Cork will be one of my stops, and I may even find some Mannix relatives. When I was a little girl, my father sang Irish lullabies to us, the same lullabies his mother sang to him, and she learned them from her Irish mother, Bridget. They were beautiful and he sang them in a baritone voice even adding an Irish lilt. It’s a lovely memory. My father talked about visiting Ireland, but sadly never made it before he passed away. I will visit Ireland one day in his honor, and to honor and discover more about my Irish heritage. Ireland holds a special place in my heart. All the best to you and the people of Ireland! I recently spent a month in your beautiful country, it was not nearly enough time! I am 1/2 Irish, Grandmother McManus from Fermanagh and Grandfather Dunne from Leitrim. I just wish I had asked them more questions about their homeland while they were still alive. I spent a few days in Belfast and it was so sad to see that the “troubles” still continue. Each night I was there, there were street shutdowns because of suspected packages. To see the murals and the fences was devastating to me. While driving through Sligo one day, I was amazed to see what I perceived to be a SWAT truck and many many military personal around a bank. Found out it was just a money delivery. And in Dublin, the day of the budget announcement, there were more police than I have ever seen anywhere. The people that I met in my travels were all so warm and helpful, it seems incongruous that there is such a heavy military/police presence needed. I applaud the efforts being made to teach children that we are all alike, regardless of where we live or what church we attend. I loved Lough MacNean‘s peace monument, “Imagine an island where we could all live in peace”. It seems to me that people who can share such a beautiful dot of land with the world and make the world feel so welcome, and has seen the horrors of wars first hand, people who are outraged at the taking of young children from a birthday party, or a woman dying in childbirth in a hospital, or a shooting, would realize that we cannot change the past. The world changes daily and we must change with it. I pray that the love the Irish people show to the world can heal the hate between the people themselves. I spent a great deal of time in Ireland (especially Dublin) in 2012. I found all of Ireland welcoming and kind-hearted. I wish I had $.25 for each pint I was offered. I felt more at home there than in the States. Truly my Irish heritage is valued and appreciated. I even bumped into you at The Nations’ Cup at the RDS competition that year. You are not hidden from your people. I love that. I have had the privilege of visiting your beautiful country twice and hated leaving both times. I consider my roots to be in Nenagh, County Tipperary, as that is where my paternal great-grandfather, Thomas Egan, lived before emigrating to the United States in 1860. He’s one of two people I have thus far been able to trace. The other was my grandmother’s grandmother, Anne Larkin, from Dublin. Having Irish blood running through my veins is a very important part of who I am and how I live. It’s difficult for the eye to light anywhere and not see something Irish…be it a bodhran, a harp, a claddagh, a Tara brooch, a Celtic cross, the framed copy of The 1916 Proclamation (which I find impossible to read without getting a lump in my throat and tears in my eyes) on my dining room wall, or some other symbolism that identifies the Irish. I soak up as much Irish history as I can. I am fiercely proud to claim Irish blood, knowing the century-long struggles of “our” people. I have no question for you, but I do have a statement…Long Live Ireland and Her People! When I was born, my mother and I lived with my father’s parents because my father was in the South Pacific (WWII). As an infant, I spent most of my time on my grandfather’s lap. As I got older, I spent my days following him around the apartment and on the floor next to his chair listening to opera. When my grandfather became too ill to sit in a chair, I played on the floor next to his bed. One day my mother took me to the dime store and bought me a wind-up, metal chicken that clucked and laid wooden eggs. When we got home I ran to the bedroom to show my grandfather my new toy. The room was empty and the bed was made. I want to go to Cork City to see where my grandfather lived (I know the address) and perhaps discover what made him the kindest man I have ever met. We were in Europe once and my husband 100% Irish background ran into some Irish men. He stated “Nice to meet you. I’m Irish American.” To which they replied “yeah, lots of rats deserted the ship.” He was hurt, yet tried to understand. Is this a common thought or did we just run into some unpleasant ones? We would love to go to Ireland yet now he has expressed thoughts that maybe we wouldn’t be welcomed, especially if looking for ancestors? Any thoughts? What a great opportunity – to be able to have the ear of the President of Ireland! I’ve always been curious about my heritage, both Irish and French, probably because my mother (my French side) set about trying to trace both sides of the family when I was quite young. If she were alive now, she would be so excited to see how far back I’ve been able to go with information about our Irish roots – Redmond from County Wexford – thanks to the internet and various Websites like Your Irish Heritage – and to Mike Collins! My grandfather (Irish) came to Maine, USA, from Newfoundland and told us stories about leaving Ireland on a ship as a youth. Now I realize that he must have been talking about my great-grandfather because the dates don’t match up to the nearest relative I can find in Ireland. At this point, I have the beginning and the end but have to fill in the middle of our history in Ireland and join the family links. I hope to achieve this soon so that my nephew, Mark, and his son will know their lineage and perhaps visit Ireland and have the facts in hand. My Irish roots and heritage mean the world to me. One of the best “exports “from Ireland have been the people over many generations. When they came to America, they brought with them, their wonderful gifts of humour, and determination and they have used these gifts to make the world a better place.. As an Irish American I feel a responsibility to continue by example to instil determination and humour to those who need it. The Irish people are the kindest people on earth and I try to follow in their footsteps. When I visit Ireland I always feel welcome and very safe. I hope and pray that Ireland will remain an example of happiness and kindness which they have achieved through generations of adversity. I pray that whatever is not so good about Ireland will be corrected by her people. I have not seen the “not so good”. Having Irish roots means the world to my family. The pride of being Irish is so important to my son and husband and now even my young grandson. My young grandson tells everyone that Ireland and especially Milltown, County Kerry is his land, because that is where his big, big, big papa’s comes from and that is from the mouth of a seven year old. When we came back from Ireland him and his 8 year old cousin just could not get enough information and they sat for three hours straight wanting information about Ireland and Milltown and wanted pictures. Each of them had handfuls of information about the family and Ireland and carried it around and shared at school their notes about everything they had. They asked us and wanted the info. We wanted to take breaks and they refused. And now all they talk about is when we can take them for a visit. The pride of Ireland is in the hearts and minds of all ages. We have photo’s and everything from St Patrick statues, and a little of everything Irish in our house. Our 14 year old granddaughter has friends from Ireland on Face book and they have made the comments and laughed that our family is more Irish and display more things from Ireland than they have in their homes. And cook more of the food than they do living in Ireland. Our hopes for the future is to be able to retire in Ireland and be able to have our children and grandchildren come to visit us and maybe also move to Ireland and have dual citizenship. We are so close to having everything we need except for the church records of his great grand fathers. When we were in Ireland to visit we were home. And when we had to leave to come home and ever since which has been a year ago our hearts have been heavy because we miss the beautiful country and the most beautiful talented people we have ever met. Ireland truly is a piece of heaven here on earth. And since then we have become good friends with many through Face book from Milltown and that are from the family still living there. Can’t wait to go back and meet with them. Such family pride in Ireland. We are truly blessed to be part of the history of your beautiful country. All of my life I have had a sense of connection with Ireland and Irish people. I love every aspect of this heritage. I finally got to visit Ireland this last year and felt like I was home. I will always feel a special connection to this land and my heritage. To me, having Irish Roots means that I came from a combination of families who all had the same convictions & deep sets of values. They came to the US with the hopes of digging their roots deeper & making better lives for their families. They instilled in me a feeling of fidelity for both countries but a yearning to hold on to the Ireland of my forefathers. I spend a lot of time searching for my families left behind in Ireland without luck. I wonder if those there wonder what happened to those who left or do they care. I visited Ireland back in 2000, and felt like I was going “home”, the people and land seemed so familiar to me. Our Family history goes a long way back “hundreds of years” in Ireland “The Tribes of Galway”, yet we came to Canada in the mid 1800’s. I know far more about my mother’s family “French/Ffrench”. And my great grandfather, Arthur French, wrote in a book “we are the French family of Frenchpark, co. Roscommon”, he also named his one son “French-St.George” so we would know exactly where we came from and our history. His mother was Magdeline Harrigan, and I think she was from co. Cork. On my father’s side “McGuin”, there is also a long line of Irish blood, but not familiar with its history. I so want to move back “home” and open up a branch of my Talent Agency in Dublin, as well buy a home in Ireland, but I can’t…..I have to be a citizen of Ireland to do so, yet, my heart and soul, tells me it is Ireland where I belong. I understand that it has to be your grandparents that must be born in Ireland to do so, yet, we are more Irish, then we are Canadian within our “years” of history, and lineage. How wonderful it would be to have this as I would love for my grandchildren to have the opportunity to attend College/University in Ireland, I want to be able to pass on our heritage to them. I have been given the responsibility to collect and display all of the items that represent “who we are and where we came from” including a land lease of Frenchpark dating back to the 17th Century. Any assistance or suggestions would be much appreciated. I am very proud of my almost 100% Irish heritage. My father’s family emigrated to the colonies pre-American revolution, but I am a fourth generation Irish American on my mother’s side. One of my goals in life is to find my Irish relatives and meet them. I wonder if the Irish wonder about their lost relatives like we wonder about them? Sometime around 1901 my Great Grandfather, Thomas Nolan brought his family to the United States where my Grandmother was born. I can remember as a child hearing about Bloody Sunday and all I wanted to do was grow up, move to Ireland and join my [brothers and sisters] in their fight for freedom and though I am no longer a child my heart still aches for Irish lives so senselessly taken away throughout the years. I am planning a trip to Ireland in the fall of 2014 for me and my husband’s 25th Anniversary, I can only hope that are plans become reality, I would love nothing more than to see the place that holds my heart hostage. I have been tracing my family history quite intensely for 3 years now. I have come to know and love your country and these Irish ancestors of mine. My gr gr grandfather John Irish was from either Cork or Kilkenny, married Catherine Welsh/Walsh from Kilkenny, and they left Ireland in the mid to late 1840s. I am at a dead end and hope to one day come to your lovely country and search for further connections. Such a happy chance to exchange a word, or two, about Ireland and my lucky link to it. I am Irish on all sides of my family but sadly I can’t trace too much of any side. Most of the problem stems from the times that my family lived in Ireland, until the 1870’s and 1880’s when they had no choice but to leave. I’m not sure I’ll ever understand why the Irish were treated so poorly by the Government in office but one thing I do know: there has to be an accurate recitation of the facts, and a correct label for the atrocities committed upon the Irish by the British. Because is a big word. They left because everything they owned was taken from them; they left because they were being persecuted; they left because they refused to die. The Irish, in Ireland, have a wonderful opportunity to bridge that gap in education: the year of the Gathering was magical but more opportunities are needed, on both sides of the pond, to allow the Irish to learn the history, language and music of their heritage. If there is any way to continue, and embellish the opportunities presented to me when I enrolled in Hibernia’s 8 week course on Ireland, it would be greatly appreciated. So much to learn and so little time. My heart remains in Ireland, land of my ancestors, but, unfortunately, my employment is here in America so the trips the Isle are limited. Thank you, Sir, for taking the time to read this. I have Irish blood running through my veins and I’m proud to be of Irish decent. I long to touch my feet on Irish soil, to breath the ocean air, to see the rolling hills throughout the country, to see the city lights at night, to visit the many castles & churches scattered throughout the Emerald Isle, to see the stone walls, to be stopped on a country lane by a flock of sheep, there’s so much of Ireland I want to see. My dream is to visit Ireland and never leave. But, with my financial situation as it currently stands, a dream it may forever be. So for now I must be content to see the sights/views of Ireland through the eyes of the photographers who post their photographs on Facebook. I enjoy the scenery in the photographers and the stories included with them. Have a wonderful day President Higgins. May God bless Ireland and everyone who dwells there. I’m an Australian with the surname of Farrell and multiple Irish ancestors – Maguires, Mooneys, Devitts and Sheridans, to name a few. For me, the strangest feeling is of being Irish but not Irish. When I come to Ireland or meet Irish people I feel something akin to grief at the disconnection. The Mexican-American writer Richard Rodriquez called it “the hunger of memory” and I think it pertains to many descendents of the “diaspora.” When I visit my Irish great-grandparents graves in the Melbourne General Cemetery I feel part of Ireland is planted there and I have the same feeling of sadness that the continuity was severed. My name is McCollonough and my Irish roots run very deep so deep in thought I didn’t think they will ever be pulled up completely. I have been away for several years but feel me homeland beating in my heart every day. Please encourage others to remember our Celtic past. My father left school in Passage West, Co. Cork, at age 12 to join his father and brothers in the Victoria Shipyard as fitters and marine engineers. He was a member of the 9th Battalion, First Cork Brigade during the War of Independence. After the Civil War, which he abhorred, he came to New York in search of work and went to sea on American merchant ships. Meantime, my mother was sent from a farm in Co. Roscommon to the States to older sisters and brother at the age of 14 in 1927. Eventually they met here and married, raising three children of whom I am the oldest and the only girl. Both of my parents loved the United States and were grateful for the opportunities it offered them. But in some way, they never left Ireland in their hearts. Every single month money went home to support parents, brothers and sisters, and many, many times I walked my mother to the post office with cartons of clothes for my cousins. We children grew up calling Ireland “home.” My parents took us home as children so that we would know where we came from and who we were; so that, too, we would know our aunts and uncles and cousins – relationships that last to this very day. They filled our home with Irish music and friends from the “old Country” and often we would find a young man at our table who had just arrived and needed a job; “a neighbour’s child,” my father would say. We took step dancing lessons from the time we could walk until as teenagers we rebelled. Education was a great value to these two immigrants who had been denied it themselves and so we all were expected not only to have college degrees, but graduate degrees as well. The other values my parents gave us are as precious: honesty, generosity, faith, love of family, and love of both our countries, Ireland and America, have made us what we are today. I fervently hope that Ireland, in recovering from financial recession, will regain and preserve her ancient culture and her people’s warmth and generosity. There is a great deal of Irish pride in my family. I am descended from Brian McHugh who immigrated with his two daughters to the US in 1868. He and his brother Thomas were gardeners for John Barrett who owned an estate in Ballintava near Dunmore, Co Galway. enough to visit twice and loved every minute. This last visit I spent a lot of time in Dingle which I found fascinating. So many Mesolithic and Neolithic sites to visit! I was also so happy to see Gaelic being taught to the children there. I also had the pleasure of spending time with Michael Fox of Boyne Valley Tours who taught me so much about Irish history and in true Irish hospitality took us to his home for lunch and to meet his family. I loved being in Ireland and would love to come back. I talk about moving there someday because of the wonderful experiences I had. I have several items from Ireland in my house that I treasure and I shot many many pictures which I frequently share and look at. Ireland is in my heart. With all of her troubles over the centuries and her continuing troubles, the Irish people are so warm, friendly and welcoming. I hope I can come back soon. I can never get enough….. I could relate so much to what other’s wrote, as well, especially those who felt they were at home in Ireland. I truly believe that Mother Ireland calls her children home. It was my dream to visit Ireland for 30 years before I was able to make the trip in 2002, bringing my youngest son with me as his college graduation gift. It had also been my father’s dream, but one he wasn’t able to live. I will swear to my dying day that he stood behind my left shoulder when I was standing on The Cliffs of Moher, looking at the sea. I could feel his presence. I didn’t turn around to look because I did not want to destroy the illusion, or delusion, by not seeing him there. As wonderful as the tour was, I much preferred my second trip, which was made with three friends, when we stayed first in Dublin for three days, visited Newgrange, and then made our way down to the cottage we rented in Puckaun for a week before returning to Dublin for one more night before heading home. I loved the freedom of renting a car and going wherever the day took us. I would love to think that I will one day return, but finances do not allow for that…however, we all have to have a dream and that is mine. My seven-year-old granddaughter wants to come with me if I do get to go. I talk to her about Ireland all the time and wrote her “Kelly’s Irish Blessing” after holding her for the first time. It’s framed on her bedroom wall, with clover that I picked in Ireland placed on the matting. I have never met an Irish person in Ireland who thought less of me because of my accidental birth in the wrong country, but I have seen posts by them on FB. I highly dispute the fact that I am less Irish than they are…it’s in the blood and it’s in the DNA. It isn’t my fault that my ancestors had to leave Ireland and it certainly doesn’t make me any less Irish than those who look down their noses at me are…or so I choose to believe. I will always be Irish first and American second. I know I’ve written to you before but don’t remember if I told you about my visit to my great-grandfather’s grave. Once I found out where he and my great-grandmother were buried, I went to visit their grave, which was about an hour-and-a-half trip from where I live. I didn’t know what I would find there…if the headstone would be intact, or if it had crumbled over the years. What I found was even sadder…there was no headstone at all. Based on the numbering system, it could have been one of several plots, so I distributed the bag of Irish soil I brought with me on all of them, as well as sprinkling shamrock seeds from Ireland on them and placing a dozen red roses in a row. My mission now is to win the lottery so I can have a headstone placed…after I pay the $2,958 owed in maintenance fees! I guess I better start buying lottery tickets, LOL. I knelt down and told them who I was and how very much I had loved their son. I also told them that when I talked to them in the future, it would be from home…the highway we had to take to get to the cemetery was a scary one! Thanks for giving me an outlet for my thoughts. I wish I could express them better than I am able to, but I have a feeling you will understand how deep my feelings are for that beautiful land where you have the privilege of living. I have been researching my Irish families for many years, and am extremely proud that I have many Irish ancestors. From the Blakes of Galway, whom I have found so much information, to the Creaghs, Sir Richard who became a Saint, and we in the Tower of London, to his nephew, the Lord Mayor of Dublin, in King James’s times, and all the history that surrounds that era. In fact I have traced my roots way back through the Irish Royals, through Knights who built castles and moats, to those who arrived from Scotland to become farmers of the north, and who were instrumental in establishing the Church of Scotland, in Ireland. In fact, I really had no idea before the wonderful world of the internet, that I was so “very” Irish. Something gets into your blood when you are able to trace your ancestors. We last visited in 2000 and drove around the whole place. From Londonderry and Belfast and the troubled areas, Dublin and the Liffey, to the beauty of Dingle peninsula, the port of Cobh and the Titanic, the Cliffs of Moher to the Blarney Stone, and the wonders of Waterford and its stunning crystal, such diverse cultures, ways of life and scenery. We are returning in 2014, specifically to visit those places where so many of my ancestors lived. To get a feel for what they saw and did before tragedy necessitated their leaving. I have read numerous books on the way of life in Ireland as it was in the 1800’s, with all the challenges that my ancestors faced in very difficult times, and I am so immensely proud that they decided to settle in Australia. So from one proud Irish/Aussie, looking forward to returning to the lands of my ancestors, and just maybe finding one or two Irish cousins, one extra message. I give us Aussies extra special pride each time we play rugby at Lansdowne Road and beat the Irish!!! I was saddened to see letters from several who didn’t feel welcome when visiting your beautiful country. My experience was different. I have had the pleasure of spending two weeks on two separate visits along with three short visits while on different tours and I never felt unwelcome. Once a gentleman came up to me in a hotel pub and said, “So, you come to find your roots did ya?” He put his arm around me and smiled. How can you resist such friendliness, I guess I must have looked Irish with my freckles. I couldn’t get over the feeling of having come home the first time I landed in your beautiful country. I have said that if I could just get my entire family to move with me I would like to live there. I have just begun to search for my roots, my maiden name is Bagley. More importantly, I feel as though I am Irish and proclaim that I am. God bless you and Ireland. My grandparents all left Ireland as young men and women – and were never able to return. My parents grew up without any grandparents, and since I’m now a grandmother myself I can appreciate how my great grandparents must have felt, and what they – and we – missed. I’ve been to Ireland many times, as I have many cousins and extended family in Counties Sligo, Clare, and Cork. But I have to tell you my mother’s story – she’s 91 now, and a few years ago I was able to take her to Ireland to meet her cousins, and to see where her parents came from. She was able to have tea at the kitchen table in the house where her father was born and raised – last house on the Loop Head Road in County Clare. And she was able to visit the house where her mother was born and raised – right near Ballysadare Bay in County Sligo (Carrowcrin, although we all call it Kellystown). She is still overwhelmed that she was able to do this – both homes are still owned by family members. I love that Ireland remains strong, and that her people are proud to be Irish. It anchors everyone in my family. As the son of a Cork man and now living in Scotland, although a regular visitor to your shores I am surprised and saddened that we seem to know more about Irish history in Scotland, all be it a lot of it is the cause of much bigotry here than a lot of people living in Ireland, and from friends there I am told much of this is to do with the lack of it being taught in schools. What perhaps surprises me the most is the lack of knowledge they have about the starvation of the Irish people know it is more commonly known as famine, but a famine is when there is no food, Ireland had ample supplies of food at this time e.g. beef, corn, pork, lamb and fish all denied to the Irish people by the British government who exported it under armed guard to England, instead of feeding those in need and I wonder if you could tell me why this is not taught or why the word famine is still being used. I understand that people and countries must move on but the main reason why so many of Irish descent live in other parts of the world was due to this and yet the young in Ireland are not being educated in this, yet so many of us in other nations can tell you about it. I love Ireland as did my mother and father and will stand up for it as I have done many times especially here in Scotland where the Irish are still being victimised in employment and the whole attitude of its time to go home Paddy which is very much alive here, but another point I have is that when I visit, there are a lot of Irish people who now tell you the same, go home Jock or plastic paddy or your father deserted the ship, not a very welcoming attitude towards visitors. While I have never had the opportunity or luck to have travelled to Ireland yet, it my one hope and dream that I’m working towards right now. Being of Irish heritage means the world to me, it gives me a sense of home that I know will never leave me. My family was never really into the heritage thing and so many things have been lost. I look forward to finding out more about my family members both from County Clare and County Galway. I hope to one day meet the part of my family that still lives in Ireland and wonder if they wonder about us, or if there are any great suggestions about going about this. It gives me a great sense of pride to know that I come from such a strong and proud people. I look forward to coming home one day…..maybe to stay…..Thank you for the opportunity to write you and expressing how welcome and loved I feel every time I meet someone of Irish heritage or from Ireland. Although my ancestors have not graced the turf of Ireland since the famine, love of its history and culture live on through their descendents. Nothing refreshes me more than listening to the Chieftains, Irish Rovers, and Clancy Brothers & Tommy Makem after long day on the job. I look forward to visiting the land of my forebears sometime next year and am eager to see all the historical locations I’ve read about and heard of for so long. Recently I was in the J.P Morgan Museum in New York City and saw relics of and the “Life of St. Cuthbert” written by Irish monks at the Lindisfarne Monastery in the seventh century and the urge to visit was so palpable, I could do naught but plan my visit for this upcoming year for the land that spawned them. After visiting Ireland proper, I plan to visit as many Irish founded monasteries as I can find. Without them, who knows how many ancient texts would survive. From the monks who inhabited Skellig Michael in the south, to Banba’s Crown at Malin Head in the north, to Spanish Armada wreck littered waters off Erris in the west and the famed shipyards of Tralee in the east, each village and clan has its own history. Most of all, I want to see my family’s native Donegal, Laois, Kerry & Wexford with my own eyes. Thank you for your valuable time in reading this note from a prodigal son. All my life I have held Ireland close to my heart and never understood why. Last year my daughter did a genealogy search. She found my great grandmother’s birthplace,a small Townland named Kilcarroll, about one mile from Kilrush, County Clare. At only 720 acres and one narrow road I was able to pinpoint where my O ‘Shea family lived just before they emigrated to the U.S. in 1864. Thanks to Google Earth I was able to follow their footsteps into town. I am 67 years old, and finely understand why I love the old time music we call Appalachian, which is mostly Irish. I now understand why I fell in love with Oregon the first time I traveled here. It is very green. The climate is similar to Ireland and it is on the west coast, just like County Clare. We have shamrock growing everywhere. Before last year, the only thing I knew about any possible link to Ireland was my name “Patrick”. I was named after my Grandfather who died when my dad was four years old. Unfortunately, none of the Irish information was handed down. My dream is to visit your beautiful country, look around Kilrush, and walk that narrow road back in history to Kilcarroll. The road my ancestors walked. I hesitated to add my comments to this letter because neither I nor my husband have any direct ancestral connection to Ireland. But like countless Americans, we know that far enough back along both our families’ lines, we would sure find DNA leading a circuitous path to Ireland. However, the love we have for your country is deep – with or without direct proof of linkage to a particular family or place. We first came to Ireland a bit over 10 years ago and have made 7 trips now, each time exploring a new area, reading more history and tradition between visits and falling more deeply in love each time. Surely among all the beautiful places on the planet, nothing surpasses the variety and richness we have seen from one end of the island to the other. We have met wonderful people, listened to music that stirs our souls, eaten delicious food, discovered Harry Clarke & St. Gobnait!, wandered fascinating byways and have found joy there together as a couple that has cemented the bond between us in a ways we could not have imagined when we married 40 years ago. We were there in 2008 when the economic crisis hit both our countries and the world and have followed the process your nation has pursued to regain economic sovereignty. We stay in contact with families we have met (B&B proprietors and others) who are now dealing with the probable necessity of a child or children to emigrate for work if they are to establish their own lives. We hold them in our hearts. We wish you well in your efforts to strengthen your nation’s response to the hard times still ahead. We plan to make another trip to Ireland in a year or so and in the meantime, tell anyone who asks that they must make the trip for themselves if they want to know true beauty, share for a bit in rich history and tradition, and meet genuinely good and kind people. Thanks very much for sharing Susan – I’ll include with the other letters! Mike. Each and every one of the letters tugged at my heartstrings. Some brought tears to my eyes and some made me smile. Mike…your cover letters gave me goosebumps and chills as I read it…how eloquent you are! It’s difficult being a displaced Irish person. I immediately fit-in when I visited Ireland, moreso than I ever have in the US. I was “home” there was no doubt about that in my mind. It brought a peace to me that I never felt before, but it also brought an even stronger yearning for Ireland than I had before I visited. I consider myself fortunate to have stepped off a plane and onto Irish soil twice in my lifetime and relive the memories of those trips whenever I feel a strong need to connect. Thank you for being here for us; it’s so good to have someone to “talk” to who really understands. Liz – thanks very much for sharing. I find it easier to be “eloquent” when all I am doing is reassembling the words of so many of our readers in their letters. Mike. Wow Mike, and Corinna – what a terrific job you did here! I worried, at first, that my letter would be the one “sour” grape in the lot but I’ve decided that most of us are saying the same thing, in different ways. I would most especially like to see the attempted extermination of the Irish intelligently taught but it’s equally important, to me, that the wonder that is the Irish be celebrated. I know that the country has fallen on hard times; so has much of the world. We have t0 make sure, somehow, that the magic of Ireland, and the Irish, continue. A huge thanks for your continued efforts to this end! Not a bother Kathi – and thanks so much for all your input! All the best – Mike. Mike, what a wonderful cover letter you penned so eloquently! You did a beautiful job threading together bits from what everyone wrote for that composite. I read everyone’s letters and they were so heartfelt with so many memories of Ireland and some really great questions for President Higgins. I am happy I was able to contribute my small part with my letter. Mike, big thanks to you and Carina for coming up with this idea and putting it all together for us! Madilyn – thanks for noting so much of what is special about the letters we’ve been receiving. Its great to be in a position to share them. Mike. Very well written letter. I have talked to many of people about the feelings we get when we travel throughout the world. Never have I felt like home anywhere but Ireland. I live near Pittsburgh, PA, and the people of this region like the simple things in life…family, friends, sports and a cold beer! I love these things too, but I have always yearned for more. My Irish connections have helped fulfill those wants. Being Irish brings me so much joy. It truly is my passion. I continue to learn everything I can about Ireland and plan on coming “home” in the next couple of years for a visit…maybe one day even longer! Thanks for the feedback Sheena – the State that gives us the biggest following on FB is PA! Probably lots of your local friends 😉 Mike. You said it perfectly! I don’t think I would change anything. If I were to include anything it would be that the world needs to be educated on what happened during the Great Hunger. All we learn here, unless things have changed in the textbooks, is that the potato crops failed. They say nothing of the workshops, or the crops being exported that could have saved lives and kept the people in Ireland. Back in 1979 when I was 17 and wanted to visit the U.K. I spent most of my time in London, because it was chic and exciting, and never made it to Ireland, at the time I thought it was too rural (which is what I love about Ireland now, the countryside) If I had known back then what I know now, I would never have gone to England at all! I plan on going to Ireland in a few years time, to see where the ancestors lived, if not exactly how they lived, back in the days they roamed the beautiful land I wish I could call ‘home’. One of my Great-Grandmothers had a daughter who had married and stayed behind in Ireland, so I might be able to look up a long lost cousin when I do make the trip! Lisa – thanks for sharing – sounds like there may be many cousins to look up! Mike. That letter brought a tear to my eye. Probably Irish is in my ancestry because it pulled at my heart from a great depth. I married a Monahan whose family emigrated from England, however, the next generation back came from Dublin. A trip to Ireland would be a trip of a lifetime and I do hope to do it one day. My son and daughter-in-law spent their honeymoon there exploring the many wonders. Their pictures had a haunting familiarity to me. The “I’ve been there” feeling was so very strong. They brought me a pebble from a beach that I am duly required to return. I hope the President understands the depth of ties to all things Irish we feel from around the world through the ancestry. I appreciate your expressing it so well to him. Linda – thanks so much for sharing. Sounds like that pebble is looking to get home! Mike. Mike, a great introduction to all our letters. I am 1/2 Irish, my children 1/4, my grandchildren 1/16, but we all identify ourselves as Irish, not Greek, Scot, German, French, English or anything else. We are and always will be Irish! As a young child we always celebrated everything Irish all year long especially on the feast of St. Patrick. The tradition has carried on in our home even though I married a French Canadian boy who has totally embraced my Irish heritage. As a young child I always dreamed of going to Ireland, that land across the sea and finally got there in 2011. When we got off the plane in Dublin I felt right at home and throughout my visit the feelings remained. Apparently this is called “genetic memory” which I had never heard of until recently. I immediately loved the country of my ancestors. The people were warm, welcoming and wonderful and always in good humour.Our line of Nolans hails from Roscrea, County Tipperary. They came to Canada in 1849 and many of their descendants live in Maniwaki, Quebec where the original homestead still stands to-day. We had a wonderful visit in Ireland and one evening we had dinner with Neil Jordan and his lovely wife Brenda Rawn. Our entire Irish experience was one of wonderment and happiness. The Guinness beer was just as wonderful as they said it would be. The scenery in your country is breathtaking and ever so green as you know. I am so proud to be of Irish descent and cannot wait to return to that wonderful land across the Irish sea. We flew from Paris to Dublin and we were ever so thrilled when we finally were over Ireland and were able to take some wonderful aerial shots as the weather that day was perfect. Thanks Mike for the wonderful opportunity to express our love for a country that is so very special in so many ways. Proudly Irish and looking forward to our next visit. Karen Nolan Cauchy. Thanks for sharing Karen – what a wonderful set of experiences on your trip – you did well! All the best and stay in touch, Mike. Oh, Mike! That SO expresses how I (and many others) feel. The feeling of being Irish and not Irish. That’s it exactly! In my case, I think if I lived in a hugely Irish-populated city like Chicago or New York or Boston, I’d have a stronger association with being Irish, but I live in San Diego, CA. I even fear that when I go to Ireland, I’ll be considered as a tourist rather than a descendant of my Crowleys, Sullivans, O’Garas, Quirks, Cliffords, Wards and Farrells. The fact is — and I’d never fully understood this until recently — that WE over here are YOU over there! You, Mike, have been a vital part of the re-connection that’s beginning to take place. You are a bridge. You help me be Irish! Thank you for everything you do. You are very welcome Sharon and thank you for sharing! Mike. I am one of the lucky ones. My uncles from the US convinced me to go back ‘home’ and connect with my dad’s family. I have met several of his first cousins on his mom’s and dad’s sides. My children and husband have connected with them as well. I have been to Ireland over a dozen times including 10days this past Aug./ Sept. with a ‘Clare’ group from NYC. I’ll be back in Feb. There was nothing I could compare to the feeling of joy I had when I danced with my dad’s cousin in the same house that my grandmother grew up in!!! I also have your O’Sullivan hooded sweatshirt…Love it! Thanks for the feedback Susan – it does sound like you are both well-travelled and well-connected! All the best, Mike. This letter to the President of Ireland is beautifully written and well thought out. It expresses the way so many of us feel. I am a little more than 1/2 Irish, and my dream is to be able to visit Ireland when I retire in 6 years – not for a couple of weeks, but to stay in the Castlepollard area for a few months and immerse myself in the place my family came from. Perhaps I will be fortunate enough to be able to do that. Thank you so much for all you do, and for speaking for the diaspora. Thanks for sharing Alice – and I hope your dream develops into a plan very shortly. Mike. Please remember natives have never suffered the loss and emptiness present in the hearts and souls of those whose ancestors were forced to leave. We are Irish and nothing but love and desire to reconnect motivates our attempts to be one with you, our family, once again. Thanks for sharing George and well said. I do believe that is becoming a growing realisation for both “sides”. Mike. What a wonderful letter you have put together! I was most touched by the phrase ” being Irish, but not Irish,” and the lines that follow in that paragraph. Thank you for doing this, I look forward to seeing what happens next. Thanks for sharing Jan. Thats a phrase many people commented on. As you say – lets see what happens next. Mike. Super letter that hit home throughout it’s text. I have always felt Irish in my heart and am discovering why now, as an adult. With parents, grandparents and great grandparents with surnames like Crow,Kane and Cassidy,Carson,Thompson and Phair how could I not feel like the Cetlic Warrior that I am. Thank you for articulating, this feeling of belonging without the geography beneath my feet, in your letter. Even though I have yet to visit your Island, I live there in my heart. Thanks for sharing Betsy and I hope you make it over here sometime soon! Mike. Thanks for sharing Sandra! 🙂 Mike. That is me in a nutshell. Though I’ll never be able to visit, the yearnings of my grandfather live through me, race through me actually-continually! He waited to long to go home he said, his mind ready but his 98 year old body unable. My promise to him, just before he went to hold his wife of 68 years once again, was, if I ever do somehow go abroad it will be to “his people”. He smiled and said OUR people! I lived on the energy that coursed through him, the stories of his Da and Mum… Even now, though he has left me, almost 100 years of history replays in my head and heart. The history -and the music of his younger years, combined with the life as he lived here, has my heart tied to the soil so far away, my soul connected to the smiles of pictures from there- as much as to my photo album here. The land calls my name in dreams. The connection lives on.. Your letter captures my hearts unspoken words well, and I thank you for writing it. I am of the Thornton and Mc’Neice, clans, one from the north, the other from the south of your beautiful land. My childhood “Sunday tea and cookies” stories encompassed both areas, and even this day bring a smile and warmth to my heart and soul..
Hi Nancy – thanks so much for sharing your comments and wonderful story! Mike. I read with interest your plan to send these lovely letters to your President. I can’t even describe my connection to Ireland, only that it’s the only place I’ve ever wanted to go. My ancestor, John Moore, along with his wife, came to Nova Scotia in the late 1600’s. I don’t know why he left, but I’m hoping to try to find out. I will be in Ireland in 2014, for 7 (not long enough) weeks, and it will be a culmination of a life long dream. Is it the music, the legends, the beauty or some sort of DNA memory that pulls me to those shores? I have no explanation, only that I want to walk on the land that has my heart and soul for as long as I can remember. I’ve even reverted back to my maiden name, as it seems to me the only name that truly fits me. I have no plans to ever change it again. Hi Sherri – thank you for sharing. Sounds like you have a wonderful trip lined up – and with plenty of time to enjoy. Mike. Mike, I really like this letter. The phrases,”Irish without being Irish” and “The hunger of memory”really struck home for me. I love meeting people from Ireland, but also feel jealous, if that’s the word, that I can’t say I’m Irish. I really can’t explain how I feel except to say that it feels like a privilege to meet an Irish person. I’m Australian and love my country. My father grandfather and uncles fought for this country, but there is still this feeling of missing out. Perhaps I’d feel different if I was able to find out more about who my ancestors were. I know my mothers people came from around Limerick. My fathers mother was a Horan. With a name of Maureen Margaret Bridget McCarthy I can lay claim to being of Irish decent. Thank you for the opportunity to talk about this. Maureen. Hi Maureen – thanks very much for the feedback and for sharing. Mike. I Loved the letter. My 3x Gr Grandfather came to America in the late 1700’s. My heart and soul are celtic and wish to someday see that glorius country, rich in heritage and faith and stories of the old country. I am proud to be Irish and would not trade it for the world. I pray always for that great nation and the courageous people in it. please know that Ireland will always be in my heart. God Bless Ireland and all its people. Thanks for sharing Anne – great words! Mike. The sentiment of this letter is wonderful. It felt as though you had taken every thought I couldn’t figure out how to express and put it down on paper. Thank you. Hi Rebecca – thank you very much for sharing that! ALl the best, Mike. I could take pieces from these letters and have my story. Rising of the Moon was the first song I learned as a little girl from my father. Being the only one in my family to not have gone over yet, someday I will. I will go to Cork and I will find some (O’)Sullivan’s. Maybe one of them will be a relative. Hi Katleen – well said and thanks for sharing! Mike. Well said Anne Marie – thanks for sharing! All the best, Mike. Hi Sue – thanks for you comments and kind words! All the best – Mike. I read your cover letter and you do write and speak what’s in our hearts so eloquently. I can’t thank you enough for helping so many Irish men and women to connect again with the land and people we love. Hi Sandra – thank you for sharing your thoughts and your kind words. Mike. This was a wonderful and unique way for those of us with “Irish roots” to express to the native Irish through their President our feelings for Ireland. Realizing the president could never answer these letters, perhaps if he is so motivated, a large number of these “personal letters” to Ireland could be published in several of the newspapers in several major cities. Perhaps a full page spread over a period of time would left the native Irish understand our feelings for them. I’ve searched for my ancestor (great grandfather) for 25 years with no success and I probably will never find where he came from etc. However, I still have an affection and love for Ireland knowing where my roots were. We’ve been fortunate enough to go to Ireland 4 times and have covered the island from top to bottom, by car and tour bus and people were kind wherever we went. Perhaps, one of the answers to why the native Irish do not have the same desire or intensity to know their foreign relatives is “they never lost their original homeland like we did”. You generally don’t miss something you never knew. Thanks for your suggestions and feedback Jerry – we hope to bring this letter “back to life” over the coming months. Mike. I am Persian, but I love Irish people. We recognize Ireland as a symbole of resistance. I live in Australia, and am suffering from English colonization and racism, although I am not a Muslim. I try to immigrate to Ireland after getting Australian passport. Please appreciate the value of your country, although it may be less developed that the UK & US, you have great people especially you don’t have crisis of internal terrorism like those countries. By the way, there are a few Irish people around me who help me out a lot in the challenge of my new life in Australia.